No doubt emboldened by their two year occupation of Caledonia, natives in Ontario are now offering deals to municipalities and developers via the four-month-old Haudenosaunee Development Institute (HDI) - the implication being they will refrain from occupying sites and setting up road and railway blocks for the right price. 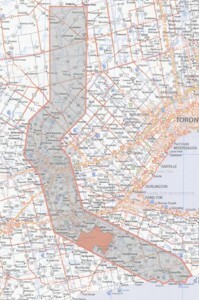 The land in question is the disputed Haldimand tract, pictured to the right, which includes not only Caledonia, but significant sections of Kitchener-Waterloo, Brampton and Cambridge. The red bit within the tract designates a current native reserve. "This is a first in Canada for a [First Nation] to say we are going to take this matter into our own hands, because historical evidence would suggest the governments of Canada and Ontario are either unwilling or incapable of finding creative solutions," said Aaron Detlor, the administrator of the HDI, which was created by the Six Nations Confederacy Council. I would say occupying disputed lands, destroying property and initiating acts of violence are examples of the natives taking matters into their own hands, but then it's not like taxpayers are getting much protection from the McGuinty Liberals and their police force. As Jay Jardine points out, the government here is working on banning lightbulbs, setting up more RIDE programs, and fretting over expiry dates on gift cards. They are also looking to ban cosmetic use of pesticides in the province, ban smoking in cars carrying minors, cracking down on "speed-racers" by seizing their cars and levying fines, and shortly after re-election, declared a new and expensive statutory holiday in February dubbed Family Day. Dalton McGuinty is advising people against paying the development fees, but he's certainly not offering residents of Ontario a choice when it comes to funding a police force that spends more time protecting you from yourself than it does protecting your person and property. "What we're doing is not any different in terms of process to what municipalities do," said Mr. Detlor, a lawyer by training. "We have some different objectives in terms of the level of environmental protection that we're seeking, as well as ensuring that the land provides for the perpetual care and maintenance of the Haudenosaunee, as was originally intended." I am a warm supporter of the rights of First Nation's people. However, there is an issue here. Although land claims, like Ipperwash (the camp, not the village) are quite accurate, and that IS Native land, it is held dear to Native people because it is their land. It has NEVER been an issue where FN bands want clear title in order to SELL it. That is sacrilegious. LOL, expiry dates on GIFT cards? They ought to fix the expiry dates on HEALTH cards. I felt badly for a man I saw in one of the clinics, who had to pony up a few hundred dollars because his health card, unbeknownst to him, had expired the previous day. I will never give up my red & white. January 18, 2008 8:44 a.m.
..until the ministry tells you to register for a photo id one. they are phasing out all the red and white ones and sending out 10 thousand such notices per week. February 08, 2008 10:45 a.m.